Expansion of the Cranbrook Airport, which will soon be named the Canadian Rockies International Airport Runway Expansion, will be completed this winter. Significant changes to the airport are currently underway to accommodate larger aircraft and more passengers. The runway will be extended to 8,000 feet to accommodate larger planes, including transcontinental and some European flights, and the terminal building will be expanded to 2,035 square metres. Other upgrades include a series of upgrades to the fuelling, baggage handling, and related operational areas. Of significant interest is the construction of a CBSA (Canada Customs and Immigrations) facility to ensure timely processing of passengers is available on demand. This is great news for those of you wanting to visit Fernie and Kimberley for great skiing and snowboarding in the winter and fantastic golfing in the summer. Calgary International airport is about 5 hours drive away from these resorts, so this airport expansion at Cranbrook will cut the travel time right down for most. Please contact rocky-peak Holidays for vacations to these resorts and other resorts in the magnificent Canadian Rockies. 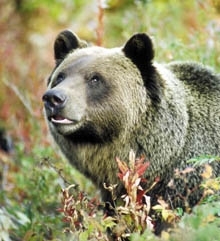 Researchers at the University of Calgary are using satellite images and ground surveys to create the most detailed map available of Alberta’s grizzly bear territory. The ongoing study could help guide policy on activities such as road building, forestry, and oil and gas drilling. With the fire hazard hovering at high in the Bow Valley and expected to reach extreme if warm, dry weather continues, Sustainable Resource Development (SRD) officials are urging caution. As of Tuesday (July 25), one small fire was under control in the Southern Rockies Wildfire Management Area, which covers the area west of Highway 22 and from the Burnt Timber area south to the U.S. border. Three abandoned fires were found on the weekend by patrolmen, said Wildlife Information Officer Janell Maitland. Lightning caused another small fire in the region on Monday. On the weekend, said Maitland, the fire hazard was extreme throughout the area, but rain on Sunday and Monday reduced that somewhat. Currently, no fire bans are in place. With weather expected to be in the high 20s again through the weekend, and with lightning possible, SRD officials will be on alert. Overall, as of Tuesday, there are 40 fires burning in Alberta, with 105,000 hectares ablaze. SRD has 142 personnel, eight helicopters, three water tankers and 10 bulldozer units fighting active fires. Anyone seeing smoke or fires should report to 310-FIRE. Motorists travelling through Rocky Mountain national parks this fall can expect to see two prescribed fires. Rick Kubian, fire and vegetation specialist for the Lake Louise/Kootenay/Yoho/Field Unit, said that depending on the conditions, Parks Canada plans to ignite fires on Mt. King in Yoho National Park and in the Baker Creek drainage in Banff National Parks sometime after the September long weekend. As smoke is always a concern, Kubian said Parks have smoke management plans for both burns. However, he added, those plans have their limits. “It is a tricky thing to manage smoke. We have some front-end capability when we start the initial ignition, but once we are into the ignition we are, to a degree, at the mercy of the weather as far as the smoke goes. “We can do some things like try and do more ignition when the venting is better and we can try and not do venting when the ignition is poor,” he said. Kubian said the ideal situation to keep smoke off the Trans-Canada Highway, the Bow Valley Parkway and out of the Bow Valley is to conduct the burn when the wind is blowing from the southwest. “The venting pattern will be to the north and the east and the bulk of the smoke should vent up the Amiskwi (Valley) and sort of north and east of Lake Louise and the bulk of the Bow Valley, but we’ve had smoke go 180 degrees on us,” Kubian said. While both burns achieve the same goals—improve grizzly bear habitat, alter potential mountain pine beetle habitat and create firebreaks—Kubian said each burn has different priorities. The priority of the 1,900-hectare Mt. King fire, located near the confluence of the Otterhead and Kicking Horse Rivers, is to decrease the amount of available habitat for the mountain pine beetle. “I think from our perspective it certainly is about the mountain pine beetle and trying to cycle that forest through fire and beetles. That is what we likely anticipate the likely scenario in Yoho to be over the next three to five years—much of the mature forest will be impacted by mountain pine beetle. “That’s a pretty important point for folks to understand,” he said. Meanwhile, improving grizzly bear habitat is the primary goal for the 800 ha. 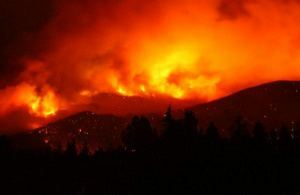 Baker Creek fire. Before the Mt. King prescribed burn can be started, Parks plans on building hand-thinned fireguards along the northern edge of the planned burn area. Ignition of the burn area will then take place by hand and by helicopter in five different sections. Banff National Park has closed a popular hiking trail as a pre-emptive move to combat human-wildlife conflict in the area. The Aylmer Pass, a well-know trail in Banff’s backcountry at Lake Minnewanka, was closed on Monday (July 24) due to a bumper crop of Buffalo Berries (Shepherdia) in the area, which will undoubtedly attract hungry bears looking to fatten up for the winter. “The berry crop in the past few weeks has come due to the warm spring conditions,” said Banff Park Warden Ron LeBlanc, who was out taping off the Aylmer Pass trail on Monday. LeBlanc stressed the Lakeshore Trail, which runs along Lake Minnewanka, is still open to the public, but that visitors should be aware the area is still an attractant to bears. Walking along the trail, the warden pointed out Buffalo Berry bushes line the length of the trail for as far as the eye can see. Traditionally, Parks officials have chosen to close the Aylmer Pass in a reactive manner. This year, however, the government agency has elected to pre-emptively shut the six-kilometre trail in order to avoid the possibility of putting visitors in danger. The trail has been the site of five bear attacks in the past eight years. All the attacks happened to individuals who were either alone or in pairs and had surprised a sow and her cubs. LeBlanc said the pre-emptive closure is part of a two-year trial period and is intended to protect bears and allow them to eat in peace as much as it is to protect humans. “We’ve initiated these strategies for public safety, but also for bears to allow them to use these areas,” he said. Additional areas are also slated for closure, including the Allenby Pass on Aug. 8, and others if Parks officials feel there is a danger of human-bear conflict. The closures will remain in place until October when bear activity in the area subsides and the bears slowly begin to retreat into their dens. At the Canmore Nordic Centre, the lower Georgetown Trail is closed until further notice due to the presence of a black bear and cubs. Bear warning signs have been placed on all CNC trails as berries are ripe and plentiful. Dogs should be kept on a short leash. In Kananaskis country, as of Monday (July 24), bear warnings in the Galatea Creek Trail, Lillian Lake Backcountry campground, Galatea Lakes and Guinn’s Pass have been lifted. A bear closure for the Picklejar Lakes area has been lifted, including Picklejar Lakes Trail in the Lantern Creek drainage, Picklejar Creek route/trail and Picklejar Connector route/trail. Backcountry users can consult both Bow Valley WildSmart (bvwildsmart.ca) or Trailex.org for wildlife updates. Hikers and campers in the Canadian Rockies are being advised to lookout for bears in the Bow Valley and Jasper regions due to the strong buffalo berry crop this year – the result of last year’s wet weather. The Grizzly and Black bears in the Canadian Rockies in Alberta rely on the berries this time of year, as it is their main source of food. The Pacific Salmon are unable to pass over the continental divide, which runs North-South and marks the Alberta, British Columbia border, so the bears here have to settle with mostly vegetation for food. A Grizzly bear requires about 20,000 calories a day during the summer months in order to build up their body fat (humans require about 2,000 calories). This means a bear will have to eat about 200,000 berries a day in order to be healthy! 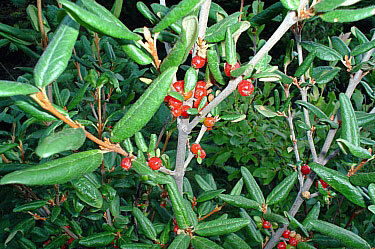 The berries have already ripened in low to mid-elevation areas, such as campgrounds and hiking trails, which are also busy with tourists. Berries in upper elevations have yet to ripen causing the bears to descend to these lower elevations to feed. Officials announced Tuesday the Aylmer Pass Trail will be closed from the Lake Minnewanka Trail to the park boundary beginning July 24th due to bear fears. This is three weeks earlier than the scheduled closing date! By hiking with a certified guide, you can avoid unnecessary situations which may involve bear encounters such as staying clear of berry patches, making plenty of noise and carrying bear spray. A certified guide knows the areas to hike and those to avoid. Contact rocky-peak Holidays for more information on hiring a certified hiking guide on your vacation, to allow you to make the most of your hiking time here in the spectacular Canadian Rockies. Boo, the young grizzly bear who has escaped twice from a mountain resort near Golden in southeastern B.C., is once again in custody. Kicking Horse Mountain Resort spokesman Michael Dalzell says the four-year-old male bear returned on the weekend and walked back into his enclosure voluntarily when staff opened the gate for him. Boo had escaped on June 25, breaking down a large steel door and clearing a series of fences. That escape came just the day after he had returned from 19 days in the wild following a previous breakout. On both occasions he was seen in the wild with female grizzly bears. Dalzell says he hopes Boo will stay put, now that the four-week grizzly mating season is over, at least until next spring. He says the bear appears to have lost weight, and probably returned because there’s food and it’s safe. Last week, B.C. Environment Minister Barry Penner suggested that the bear be turned loose wearing a GPS collar, so that the public could keep track of him. Dalzell says that’s still under discussion with the ministry, and the collar is on order. He also says there’s been no decision on the possibility of surgery to neuter the young male. 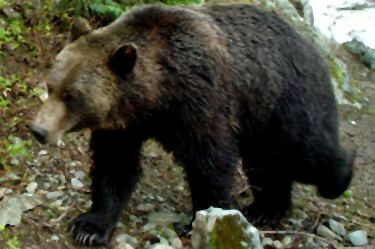 The bear was orphaned in northern B.C. in 2002 when a hunter shot his mother. The hunter was fined $9,000. Boo the grizzly bear is shown in this undated handout photo. Boo has a taste for freedom that apparently wasn’t satisfied the first time he broke out of his man-made den at a Golden, B.C., resort in search of a girlfriend. Just a day after his first, two-week romp in the wild ended with a tranquillizer dart and a helicopter ride, the grizzly pulled an even greater escape. Each mountain pine beetle is the size of a grain of rice, but the voracious insects have already devoured an area of B.C.’s forest the size of Iceland. Another two million hectares in Alberta are now at risk, and the infestation could spread to Canada’s boreal forest. “It likes all pine species and we’ve recently discovered this includes jack pine, which is a component of the boreal forest,” said Allan Carroll, a research scientist with the Canadian Forest Service. Mountain pine beetles began invading parts of Alberta four years ago. If the beetles jump from the lodgepole pine to the jack pine, an infestation could wipe out billions of trees all the way to the East Coast, he said. The frontlines in this battle are the northeastern slopes of the Rocky Mountains. Jasper National Park warden Dave Smith said because Canadians are so good at preventing fires, the forests are old, weak and susceptible to infestation. Global warming has also helped the pine beetle along, as cold winters can help slow infestations. If enough infested trees can be removed, it may prevent the kind of destruction British Columbia is experiencing from occurring in Alberta and the rest of Canada, said Carroll. The beetles are less than one centimetre long, but they are one of nature’s most efficient predators. Several thousand beetles burrow under the bark, laying eggs and destroying a valuable, 80-year-old tree within days. When the tens of thousands of eggs hatch, they decimate the next stand. Alberta has been falling and burning individual trees to kill the bugs, and is planning a large-scale burn in Willmore Wildnerness Park in August. The federal government is spending $40 million to try to slow the spread of the infestation. Fish for free July 8th and 9th! Alberta residents can fish for free in any public water body in Alberta, outside the national parks, that has an open fishing season on July 8th and 9th. This event coincides with National Fishing Week. Alberta presents two free fishing weekends each year: the summer free fishing weekend and another in February to coincide with Family Day. Boo, the freedom-loving grizzly who has twice busted out of his large wilderness compound, may be having fun in the sun as he cavorts in the wild with a new female companion. But his lust-life looks to be short-lived. Castration is looming for the powerful young male. That is, if his caretakers can hold him long enough to put an end to his romantic rampages. To make his second great escape, Boo crashed through a 180-kilogram steel door and stormed over a four-metre-high electrified fence that he managed to deactivate. Early yesterday morning, helicopter searchers spotted him for the first time since his weekend break for freedom. He was in a remote alpine area six kilometres west of the Rocky Mountain wildlife refuge where he had been kept for the past two years. “He was found with another grizzly bear, presumably a female. Male grizzlies don’t hang out together,” said Mike Dalzell, spokesman for the Kicking Horse Mountain Resort that runs the refuge. The same thing happened when Boo went AWOL for the first time earlier this month, albeit in a more genteel manner, by digging underneath the compound fence. He was soon seen in the company of a female grizzly, at least for the first few of the 19 days he was on the lam. “We were discussing it over coffee today, trying to decide who was at fault,” joked regional environment manager Wayne Stetski. But Mr. Stetski, along with other grizzly experts, knows that the question of what to do with Boo is a serious matter. Almost certainly, if the decision is made to capture and bring him back alive, the ultrafrisky grizzly will lose his sexual prowess. “That’s very high on our list of options,” Mr. Stetski said. “He never exhibited interest in getting out before. Then there was a female on the mountain and the interest definitely increased. Mr. Stetski said he is also in awe of the “strength and intelligence and determination” shown by the 4½-year-old bear in freeing himself from a secure area in the wildlife refuge thought to be, like Alcatraz, escape-proof. For the moment, searchers are merely monitoring Boo’s whereabouts. There are no firm plans to capture him because there is not yet a secure place to house the 480-kilogram grizzly. Experts agree that Boo’s future should not include the wilderness he yearns to roam. They say he is short on survival skills and is a risk to humans because of his familiarity with them during his long captivity. “He’s become a problem,” said Ken Macquisten, veterinarian for the two young grizzlies currently kept in a large open-air refuge on North Vancouver’s Grouse Mountain. Boo has been kept in various wildlife refuges since he was orphaned as a cub, when his mother was shot — illegally — by a hunter. Mr. Stetski said Boo’s predicament has prompted a lot of philosophical debate about “what’s right and what’s wrong in dealing with grizzly bears.